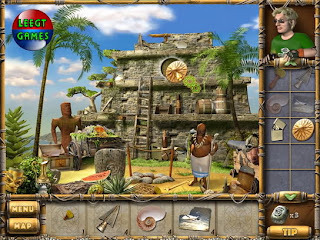 The new iPhone application “The Treasures of Mystery Island” is released by Alawar Entertainment for those who are looking forward to diving into the mysterious adventures. This new app takes hidden object games to the next level with some brilliant artwork and tons of mini games. The player not only finds the hidden objects in one particular scene but uses those found objects to move from scene to scene. The game is quite exciting and won’t leave you indifferent. As for the main plot of the game it’s about a young man Alex who was making just another routine run across the Atlantic Ocean in his cargo plane when his girlfriend's lucky talisman started to glow. Moments later, as his ride dove toward choppy waters, he found himself parachuting to the sandy expanse of an uncharted island. When a native rescues Alex, he begins a hidden object adventure that will take him into the heart of a strange island, where hidden treasure and the curse of an angry god await! The game offers you 20 beautifully detailed episodes to complete, over a dozen Mini-Games to beat and plenty of hidden objects to find and return them to the proper places in order to get help from the natives. Thus you’ll be able to earn tons of Trophies.